A wintry April Saturday, a few in.A customer regaled the room with details of unseemly goings-on at a memorial service. Ramsgate Brewery (Gadds') - Hoppy Pale 3.60 Golden pale.Tropical fruit,gravelly hops,long hoppy finish. Delicious lunchtime beer. Pretty near full on a cloudy Saturday early afternoon. Three Legs - Pale 3.70 Grassy.Hints of austerity. A fellow occupant of the window table declared it to be delicious:it was. Busy on a gusty Saturday midday. Cellar Head - Hop Project 001 (CF247) 4.50 Hazy straw gold.Peaches,sun warmed straw.Intruiging, brewed with the experimental hop CF247. Busy on a Saturday lunchtime:most tables occupied. Three Legs - English IPA 5.00 Resinous hops,stone fruit.Moreish. Noon on an unseasonably mild Saturday.I'm getting recognised by other customers,help! Three Legs - Pale 3.70 Pale and nettley.Some haze. Early afternoon on a mild and misty Saturday.Busy:some galanthophiles were defending their obsession. Cellar Head - India Pale Ale 5.00 Juicy,fir tree hops. Early afternoon on a mild but gloomy Saturday.Several in,discussing micropubs.A cracking list today. Larkins - Porter 5.20 Exemplorary.Bible back,roast,raspberries.On tiptop form. Noon on a chilly Saturday.The foibles of the Cranbrook rozzers of yore were discussed. Kent - KGB 4.10 Decent peppery farmyard bitter. Early afternoon- my first visit. 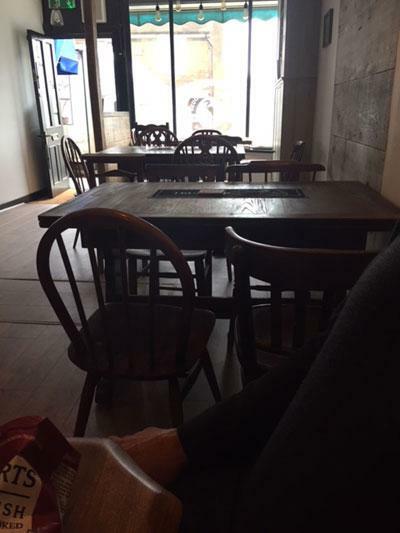 Good busy-but-mellow atmosphere. Free snacks on the bar - like a proper old-fashioned Sunday lunchtime. Cellar Head - Winter Pale Ale 3.90 Interesting flavour - for a pale ale - brewed with Phoenix hop. Midday on a mild but gloomy Saturday.Coughs and Colds were the order of the day.Doncha just love January? Tonbridge - Ebony Moon 4.20 It's been a while since I've drunk this.A delightful easy drinking 'session'Porter. 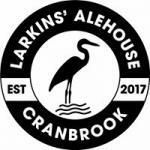 The pub is found in Cranbrook, Kent, TN17 3EB. Long awaited micropub in a former florist's shop in the High Street. Long narrow room,with servery bar counter to the back. Beers served on gravity dispense from a cool room to the rear. Some tables and chairs to the front. Opened on Friday 6th October 2017. Unisex toilet. We have visited this pub 37 times, seen 95 different beers and tried 32 of them.